Photo Credit: The Experimental Gourmand. 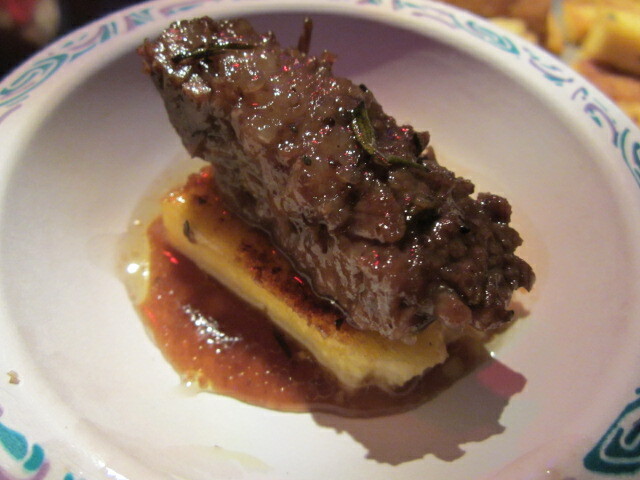 Grape jelly and rosemary braised brisket on Polenta by Chef Thomas Perone. When I grew up in Queens, New York, a housewife's fail-safe recipe consisted of baking a brisket with Heinz's chili sauce and Lipton's onion soup mix. This usually was done in a throwaway aluminum pan covered with a thick layer of foil. I was reminded of this last week when I was judging a brisket cooking contest in Manhattan, sponsored by Jimmy Carbone, food impresario of Food Karma Projects who is also the owner of the affable Jimmy's No. 43. Proceeds of the boisterous evening went to support a local charity. In a frenzy to be named the Brisket King of NYC, an honorific similar to Iron Chef in some circles, a dozen die-hard guys and gals (mostly guys), competed for top honors with new styles that could rival the house of Chanel. It's funny to think of brisket being coiffed and demure and in some cases that evening it was: delicate portions of brisket Shabu-Shabu, wine-soaked brisket on a raft of melted fontina, and brisket croquettes served with mustard aioli. But mostly the stuff belonged in a Benetton catalogue, uniting the flavors of the world, from Red mole brisket with avocado cream and pickled onions, to a red wine, grape jelly and rosemary braised brisket on polenta, to oak-smoked brisket with a green papaya salad, to burnt ends with foie gras, truffle juice and tangy slaw, from worcestershire-braised brisket with horseradish, to beer-braised brisket with roasted grape chimichurri. Clearly, not your mother's brisket. Beef brisket comes from the lower chest of an animal and its muscular function is to support most of the weight of cattle, since they have no collarbones. Brisket gets lots of exercise and therefore is one tough piece of meat. That's why it needs long, slow cooking to the point where it is well beyond well-done. And why do we love it so? After the collagen, developed by all that muscular stress, is dissolved during cooking, you get an extremely juicy, extremely flavorful piece of beef. Slow cooking is achieved in a variety of ways, depending on where you come from. Out west, smoking from indirect heat over hardwood coals -- in other words, barbecuing -- works wonders. If you're Irish, you immediately think of corned beef. If you're Jewish and your parents came from Eastern Europe, well then, you'd use brisket for pot roast. They're hot on brisket in Hong Kong, too, with restaurants that specialize in nothing else. In Thailand, you'd cook it gently in yellow curry paste and coconut milk. Of course, it's not that simple. An entire brisket consists of two overlapping muscles whose fibers run more-or-less 90 degrees from each other. Supermarkets often sell these cuts separately: what's called "first cut" or "flat cut" is thinner and leaner (and therefore a bit drier); the "second cut" or "point end" or "deckle" is thicker, juicier, and much preferred in our household -- because what's the point of brisket if it isn't lip-sticking succulent? Both cuts have a fair amount of fat on or in them and you want to leave that fat on during cooking to keep the moisture in. Because people are fat-o-phobic, many food markets only sell the first cut. But If you're cooking an entire brisket, which I like to do, then you need a quick carving lesson since the fibers of each cut aren't aligned. Much is made of this minor complexity but all you need do is carve the thin cut against its grain, then turn the meat (or flip it over) and carve the thicker cut below against its grain. And there's a new brisketeer in America: Stephanie Pierson. 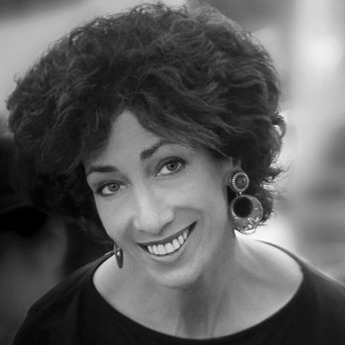 She is the author of The Brisket Book: A Love Story with Recipes (recently published by Andrews McMeel). It is a delightful read. While I can't supply you with any of the winning recipes, I can give you a winner my own that I created for Bon Appetit (below) or check out my "Tamarind Brisket" on my blog. Preheat oven to 300 degrees. Process orange juice, dates, garlic and cloves in a blender until smooth. Heat 3 tablespoons oil in large wide ovenproof pot over medium-high heat. Add onions and whole shallots. Cook until onions are deep golden and shallots begin to brown, about 20 minutes. Transfer shallots to small bowl; reserve. Add broth to onions and bring to a boil, scraping up browned bits. Pour onion mixture into large bowl. Add 2 tablespoons oil to the same pot. Season brisket with salt and pepper. Add to pot and brown well on all sides. Turn brisket, fat side up. Return onion mixture to pot. Add tomato puree and orange juice mixture. Bring to a boil, stirring to blend sauce. Cover pot and bake 2 hours. Add shallots and potatoes. Cover and bake 1 hour. Uncover and bake until brisket is tender, occasionally spooning sauce over, about 2 hours longer. Let rest 30 minutes. (This can be made 2 days ahead. Chill uncovered until cold, then cover and refrigerate.) Scrape sauce off brisket. Thinly slice brisket across the grain and return brisket to pot. Add the potatoes and shallots and heat until hot. Serves 8 or more. Rozanne Gold is an award-winning chef and author of "Eat Fresh Food: Awesome Recipes for Teen Chefs;" "Healthy 1-2-3," and "Radically Simple." Rozanne can be found on Facebook at www.facebook.com/RozanneGold.